Dissappointed at not being unable to reach the I’klektik ArtLab in South London to hear the MAGIC SCIENCE QUARTET conjure up a live score to a vintage silent film that reinterpreted the mythological tale of OEDIPUS I was much relieved to discover that the quartet was to join forces with the ever innovative Black Top duo for a late night benefit session for the Vortex in Dalston. I arrived in the wake of Christian Muthspiel’s session to find legendary bassists Steve Swallow and Henry Grimes in conversation. 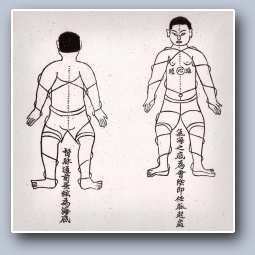 A sight in itself. 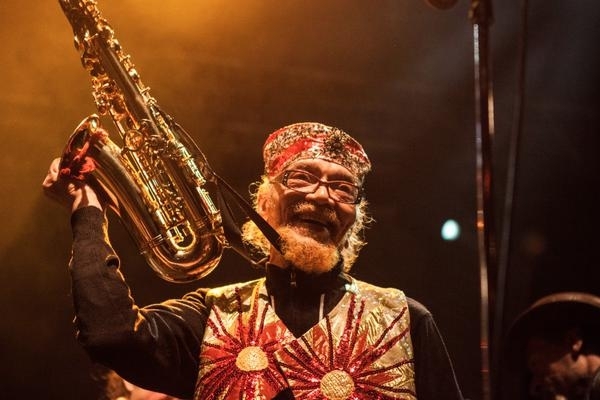 Following a feverish onstage swap over of kit and minimal sound check, 91 year old Marshall Allen, forsaking any formal introductions, stepped up to the mic to hush a room full of cosmic music devotees with a furious flurry of sound that couldn’t have come from any other horn player on the planet. Marsall was out of the blocks quicker than Usain Bolt leaving his fellow musicians to simply follow in his wake. 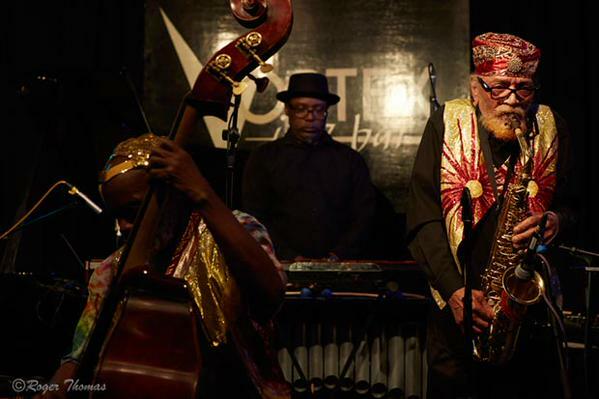 In his inherited role as skipper of Sun Ra’s Arkestra he is a natural leader and the fellow members of the Magic Science Quartet immediately locked in behind him. Tucked away behind Black Top’s Pat Thomas, who was already bouncing on his seat as he sought out a swirling myriad of sounds from that radical self programmed keyboard of his, was Swiss pianist and ‘spirit drummer’ Ka. 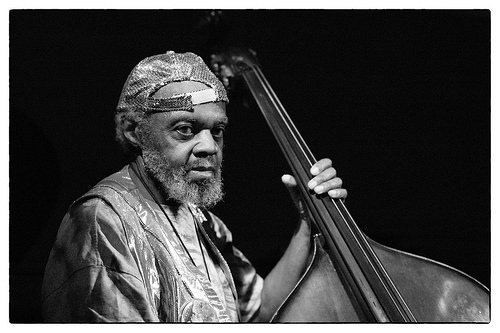 Her playing demonstrated both grace and lyrical attack while the bass of the legendary Henry Grimes quietly but confidently shape shifted beneath the drums of Avreeayl Ra. The art of improvisation lies in listening. Feeding on the powerful dynamics of the ensemble Orphy Robinson delivered cascading waves of sound and stark repetitive grooves on the xylosyth – the triggers and samples that normally characterise a Black Top performance were left for another day. Just when I thought it might just be all over, Henry Grimes laid down his bass but swapped it for a violin. An ethereal and memorable excursion punctuated by bamboo flute, ensued and offered refuge in another musical dimension. The avant garde meshed with the tradition to close the night and Marshall’s response to Grimes’ easy snappin’ bluesy bass lines was, as ever, sonically mesmerising. His right hand fluttered across the keys of his alto, the sound of which simply grew in power.Overall, it was a dazzling demonstration of purely improvised music where science and magic produced a profound and pure energy! The last bus had long gone but I was happy to walk home with the music, as Ornette once said, dancing in my head. Here’s hoping I’ve the energy & spirit that Marshall Allen’s got when I’m 91! This entry was posted in Deep stuff and tagged Black Top, cosmic music, Henry Grimes, I'klektik, Jazz, magic Science Quartet, Marshall Allen, Orphy Robinson, Pat Thomas, Sun Ra, The Vortex. Bookmark the permalink.